I’m not sure what I expected the first D23 Expo to be like, but it never occurred to me that even Disney can’t transcend most aspects of the typical convention: the bland, greasy food; the soul-sucking fluorescent lighting; miles of endless halls to traverse; and lines, lines, and more lines. 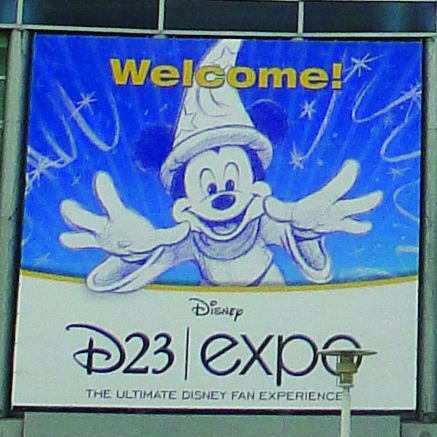 Don’t get me wrong—we had some great experiences at D23 Expo (hello, Johnny Depp 20 feet away! ), and sometimes it was a lot of fun. But I was totally unprepared for the enervating experience it turned out to be. I guess I thought it would feel like a Disney vacation, but it felt more like work (and I wasn’t even officially on the job representing PassPorter)! I’ll just pontificate a bit more before jumping into the report: The thing that was most frustrating to me was that the head of D23 said they purposely counter-programmed hot-ticket sessions to make Expo-goers feel like there was just too much good stuff to see and do. Call me Type A, but I HATE feeling like there is just too much good stuff to see and do! The first few days of the Expo, my husband and I were running around like chickens with our heads cut off trying and failing to make all the good sessions and feeling totally cheated that we hadn’t even had time to explore the booths on the show floor yet. The next-most-frustrating thing was the endless queuing. OK, I know – many people told me over the course of the Expo that Comic Con is 10 times worse and you basically can’t get into any of the sessions unless you camp out for 3 days or something. Whatever. This is Disney. They invented the FastPass. Surely they can come up with something better than standing in a 2 1/2 hour line just to see an hour-long presentation that starts an hour late with no explanation. Patrick thinks there should be Convention FastPasses, but I think then people would just form snaking lines for those… His other idea was for Disney to have something interesting for us to see/do in all these queues, and I agree. Heck, even ODV carts selling $2 apples would give us some entertainment, but what about characters who pass along the lines or trivia questions projected on the walls or something? OK, maybe I’m mostly focusing on the negative stuff because so many people were online afterward raving about D23 Expo. I have to say, for a first-time event, it went really smoothly. And the tickets were relatively reasonably priced. And there were a few genuinely “wow” aspects. So, without further ado… for the moment… until I start ado-ing among the reporting…. I give you….